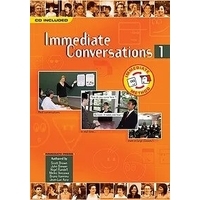 ​ ≪Immediate Conversations 1≫ is a textbook / workbook aimed at Japanese JHS students (complete beginner to false beginner level). Its purpose is to get students to practice real-time, two-way conversations within the classroom. We believe that having successful experiences of real conversation at the early stages of English learning is very important for students’ future success. This textbook provides them with exactly what they need: simple linguistic material that is immediately applicable in a conversation, and some basic pragmatic advice on how to conduct a conversation in English.